Even though everybody safely exited the house, it still left our neighborhood in shock as we wondered how we could protect ourselves from horrific incidents like this in the future. Four days later my mother attended the West Bend School District Foundation Gala fundraiser, where individuals bid on auction items and all of the proceeds directly benefit the West Bend school system. At the gala, my mother won a Certified Firefighter Safety Inspection, so a firefighter would come to our house and explain how to prevent a fire and what to do in case of a fire. We later discovered that the firefighter who would be coming to our house on Dec. 1 was Paul DeLain, the AP Environmental Science and honors biology teacher at West High. DeLain has been part of the Germantown fire department for a total of 11 years, and an officer and EMT-Basic for the past five years. When he arrived, DeLain began by discussing smoke detectors, which come in two types. The first type is an ionization smoke detector, and these are better for fast flames and quick burning fires, which are the most common in homes. The second type is a photoelectric smoke detector, and these are best suited for smoldering fires; however, DeLain says that all levels of a building should be equipped with both of these types. Moreover, regardless of the type of smoke detector you possess, they should be replaced every decade and have their batteries, preferably Duracell batteries, changed every six months to a year. DeLain also strongly recommends a hardwired system of smoke detectors, which means that when one smoke detector is triggered, it will prompt the rest of them in the building to alarm. Carbon monoxide, known as the “silent killer” due to its lack of odor and color, is most common near points of combustion, such as the furnace or water heater; however, carbon monoxide detectors should be located a minimum of 15 feet away from such objects, as it is normal for appliances burning fossil fuels to release a small amount of carbon monoxide. Furthermore, CO detectors should be arranged outside every sleeping area because sleeping people do not feel the symptoms, such as headache, weakness, or dizziness, of carbon monoxide poisoning. These detectors should be replaced every six years, and their batteries should be reinstalled every six months to a year. For fire extinguishers, ABC extinguishers are used for wood, paper, electrical, and grease fires. DeLain demonstrated how to use a fire extinguisher (see video below) and offered a helpful acronym called P.A.S.S: Pull the pin, Aim at the base of the fire, Squeeze trigger, and Sweep across the base of the fire while walking towards it until the fire is extinguished. Once the fire is extinguished, you should still call 911 to make sure everything is secure. Later in the presentation, we discussed what we should do if we woke up to a fire in the middle of the night. It is important to acknowledge that doors can be used as shields from the fire, so it is best to sleep with your door closed. However, since your sense of smell does not function at some stages in the sleep cycle, keep in mind that you still need to hear the smoke detector alarm in case you cannot smell it. When you wake up, even though your first instinct is to sit up in bed and run to the door, you would be at the same level as the smoke, which would cause you to inhale it. Therefore, you would want to roll off the bed, crawl to the door, and feel it in multiple places with the back of your hand all while staying low. If the door is cool, proceed with caution toward the exit of the building. When you exit, if you have to travel down stairs, sit on the stairs and crawl on them feet first because you will be able to feel for any debris or holes in the stairs and avoid the smoke. However, if the door is warm, place something such as a towel or a blanket under the door to stop any smoke from entering, then crawl to the window and open it. If it is safe to exit the window, climb out. If it is not, start tossing out objects such as pillows, blankets, or clothing. Because of this, when the first arriving fire officer does a 360 degree loop of the property to look for fire, smoke, and articles thrown from windows, the objects will indicate that someone is inside that room. Once you are outside, report to a designated meeting place, such as a neighbor’s house. When DeLain is not teaching, he is on call for fires. He is a POC (paid on call) firefighter, which means that even though he received the same education and training as a full-time firefighter, he volunteers his time waiting, but he is only paid when he is on call, which is every other week from 6 p.m. to 6 a.m. When he is wearing all of his equipment, including the airpack and mask, it weighs about 67 pounds. Included in that is the bunker gear, which is the yellow protective suit that firefighters wear, and that is made of three layers. The first layer is made of kevlar, and it is meant to repel water; the second layer is the liner, which is meant to keep him dry; and the third layer is inner thermal protection to keep the heat of the flames off of him. The suit can withstand 500 degree heat for five minutes, but DeLain reports that he has been in fires over 800 degrees. Firefighters also wear a fire retardant hood around their face and large, steel-toed boots to protect their feet from debris like broken glass. In the jacket, DeLain carries safety glasses, a notepad, latex gloves for medical purposes, a rope to carry victims, and wedges to open doors. 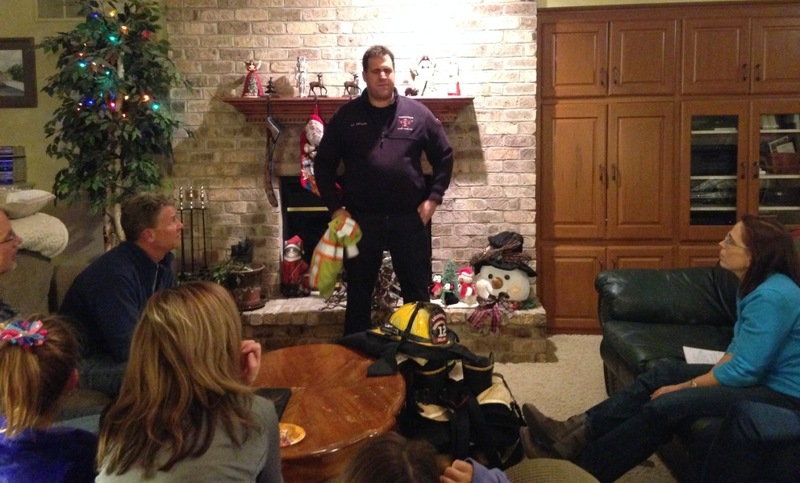 DeLain encourages prospective emergency responders, such as firefighters or EMTs, to join the Firefighter Explorers, a program hosted some years in West Bend. If you are 16 years old and interested in this program, please inquire at the fire station on the corner of Washington Street and Seventh Ave. 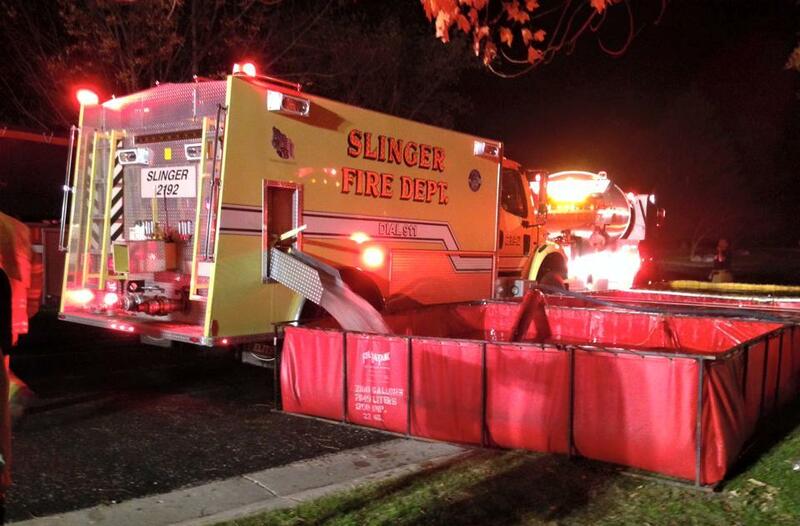 The Slinger fire department provided water trucks to help put out a house fire in West Bend on Oct. 20. Water trucks from several departments were needed because the neighborhood does not have a fire hydrant. Nice job Kathryn. You really honored the profession of firefighting here.